It’s been a while since I did a Want Books post. I wonder if making posts like this helps in actually finding books that are hard to find here? Or do they somehow get to the people who work in bookstores and make them get the books we want and stock it in their stores? I know it helps me get the books, because somehow I find myself deciding to get the book on my own soon after. I know making posts like these makes other people’s wish lists bigger, too. Hmm…I wonder who else gets influenced? Anyway, I’m rambling. I thought of posting this book here because it’s been released since November and I still can’t find a copy. RAWR. Two words: Jasper Fforde. The synopsis just sounds so Fforde and so awesome! I remember asking Fully Booked about this when I found about its release and they said stocks should come in by Christmas…but I haven’t seen a copy of this until now. I also remember rewarding myself with a Kindle sample of this and there were many times when I was thinking of just getting the Kindle version first because it’s Jasper Fforde anyway. However, when I went back to purchase a copy…alas! It was pulled from the US store, since it’s not yet released in the US (I think). Sadness. I’m thisclose to putting an order for this from Book Depository but I’m holding off because (1) I really want to know how much it would be if/when Fully Booked has stocks and sometimes their price is lower and (2) I’m really not in a hurry to read it anyway. On another note, another Fforde book is coming out this year — the next installment of his Thursday Next series. It looks like 2011 will be a Fforde year, yes? :) Brilliant. Hi, Tina! Ordered this from Book Depository middle of December, but it still hasn’t arrived. Gives me something to look forward to, though. :) And yes, this will be a Fforde year! Hi Honey! I tried to see if I’d have bigger discount if I order at work, but I think it’s just the same. Oh well. Did you order the hardbound copy? There’s little price difference between that and the (trade) paperback, so I’m not sure what to order just yet. Too bad about the discount. How much discount does it say, anyway? Anyway, I ordered the hardbound copy for a little over $13. That said, five out of my six Book Depository orders arrived today, and The Last Dragonslayer was the missing one. I hope the Post isn’t holding on to it bec it’s a hardback. It’s $16 for hardbound and $14 for paperback. Boo. Ah well, I can still wait. I hope your copy arrives soon, though! 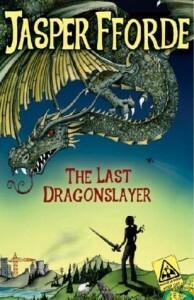 The Last Dragon Slayer sounds like a great story I didn’t know Jasper Fforde already has a YA book. I haven’t even started The Eyre Affair. I have been itching for it ever since you recommended it. I’ve read the summary of the book and it sounds awesome! A bibliophile would really love it with all those literary characters in the story. And now there’s a next installment coming out? Gah. I need to save up for the first installment and fast! So then I can finally know what you’re all talking about when you say the book is “so Fforde” ^^.